In Episode 9 of her radio series, Towards a Thriving Planet, Monica Sharma interviews Karen. Download the full MP3 recording here. Together they explore the powerful roles people can play in forging connections between different themes and fields, breaking ground for new ways of thinking, and opening up exciting frontiers for transformations to sustainability. They discuss how to shift perspectives on climate change, from seeing it as a technical problem linked to greenhouse gas emissions to a social and human issue related to past and current systems and cultures that are undermining natural ecosystems and human well-being. When it comes to climate change, there is a tendency to look at people as the problem – reducing them to the size of their personal carbon footprint, rather than activating individual and collective agency and the human potential to shift systems and create alternative economic and social relationships. It is not surprising that many people feel overwhelmed by the magnitude of the problem and are convinced that they cannot really make a difference, as if our small actions are insignificant. Karen and Monica discuss how a conscious full spectrum approach can be used in research, education, and engaged action, to change the narrative on climate change, helping people recognize that they matter more than they think and they have an important role to play in leading change. Introduction by Monica, Karen talks around 26 minutes. The radio show first aired on 28 August at 14:00 Norwegian time (8 pm EST). 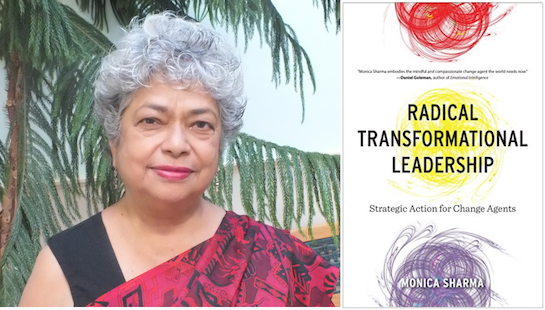 Monica Sharma is an international expert and practitioner on leadership development for sustainable and equitable change. Using her conscious full-spectrum model, her approach works to simultaneously solve problems, shift systems, and create new patterns sourced from individual inner capacity and transformational leadership. She has worked for the United Nations for more than twenty years, and is currently engaging with universities, management institutions, governments, businesses, media, and civil society organizations to create sustainable and equitable change. She has recently published a book Radical Transformational Leadership: Strategic Action for Change Agents, which was Gold Winner of the Nautilus Book Awards in the Business and Leadership Category.